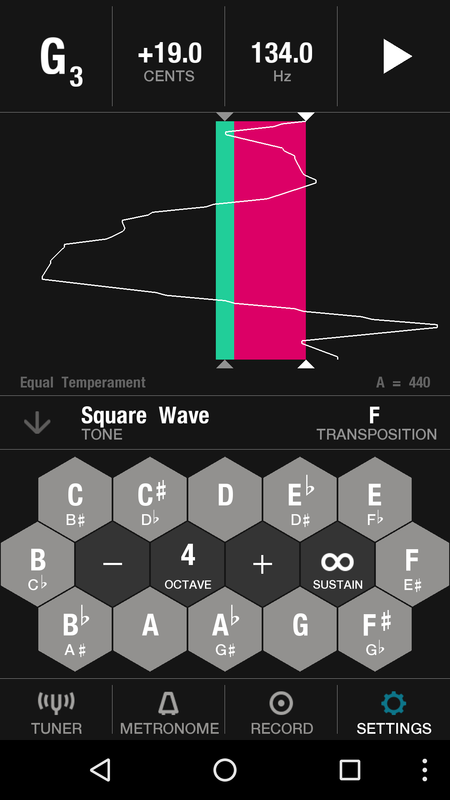 The second app in my series of musical app reviews is Tunable, by Affinity Blue. 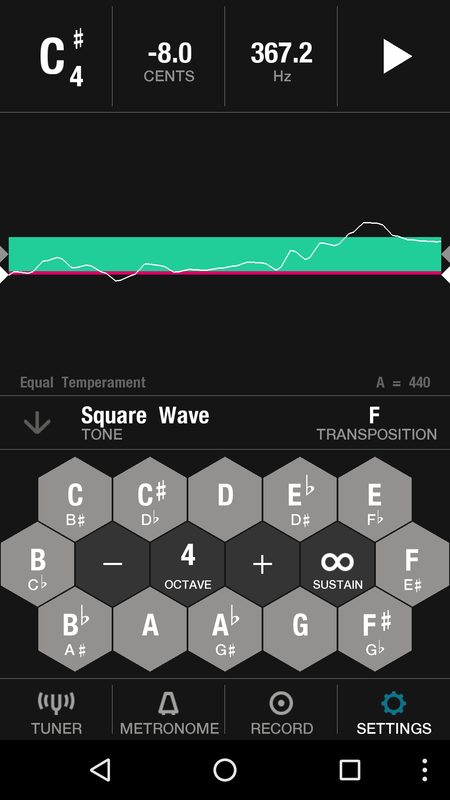 This is a much more well-rounded app than ClearTune, featuring a tuner, metronome, and a recorder. Tunable is available on both iTunes, Android, and even the Amazon app store (for Amazon Fire tablets) for $2.99. Like before, my screenshots and my thoughts come from the Android version of this app. As always, if you have any thing to add (especially about the iOS version), please do so in the Comments section below. The main tuner screen. Lots of information here! You can see the vertical green bar is a little bit narrower here. This is the “Intermediate” mode of tuning. And even narrower here. This, not surprisingly, is “Advanced”. You can also turn the bar horizontal instead of vertical, if you prefer. Or make it bigger and lose the pitch pipe buttons. They are easy to get back, though, just tap the arrow on the bottom-left. The metronome is, in contrast to the tuner, very simple looking. But it has pretty much all you need! Some of the options for the tuner. All the options here are not adjustable from the main tuner screen. 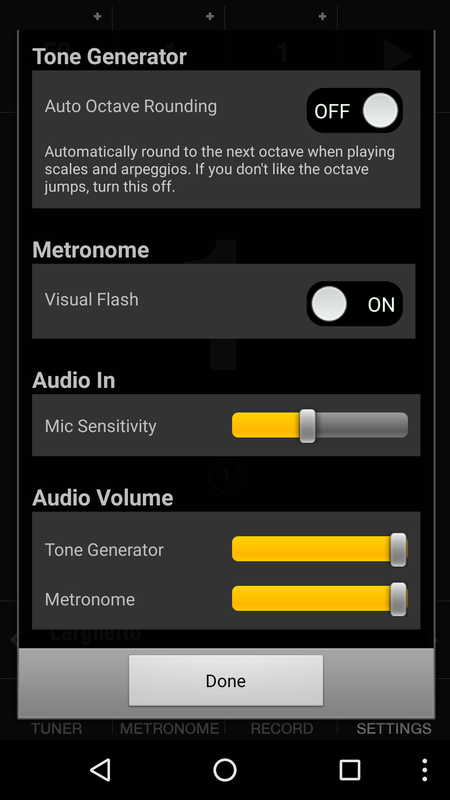 Some more options – you can adjust the volume for the pitch pipe and the metronome separately. 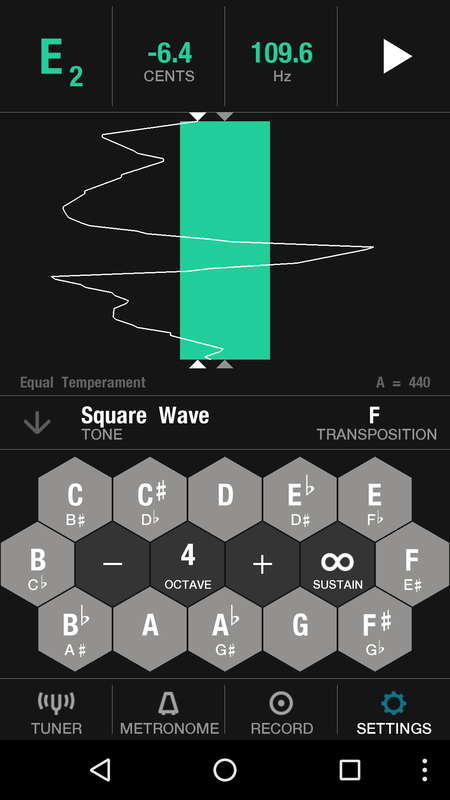 The recorder doesn’t even get its own screen – just an overlay with the option to add reverb. You can see a few details, rename it, delete it, or share it by clicking on it. A nice all-in-one solution featuring the three most common (and necessary) features for most musicians. The tuner screen is densely packed with information, but pretty easy to read at a glance. 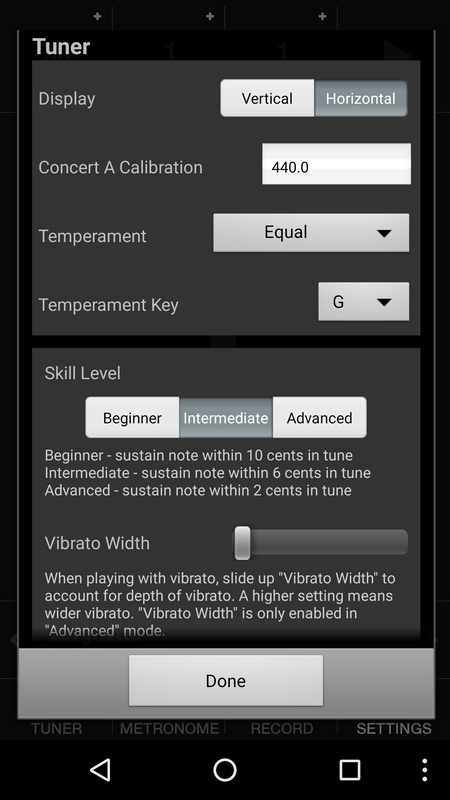 The three different “difficulty levels” for intonation make this a nice app for beginners to advanced players. 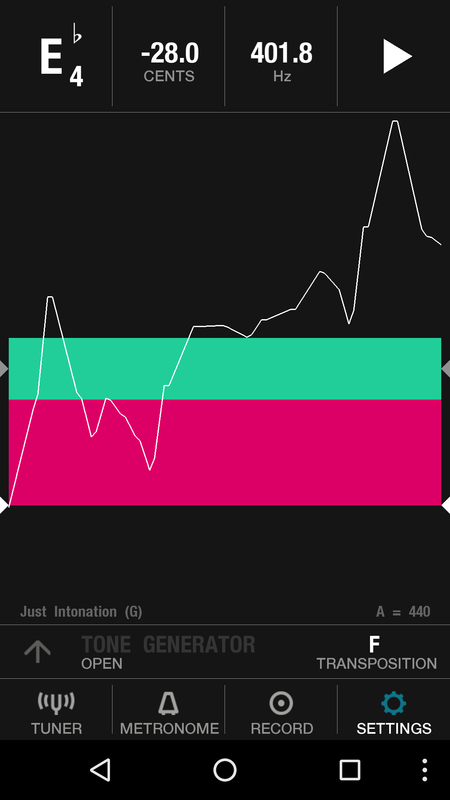 The unique tuning screen that shows your intonation along a timeline is also pretty cool. The tuner and pitch pipe have lots of features – different tuning temperaments, different waveforms, etc., and the tuning screen offers easy access to many of the most-used options. While the tuner is great, both the metronome and recorder seem a bit simplistic by comparison, although they are both functional. The light option is – at least to me – super ugly. While you could probably guess from the name of the app, the tuner really is the star here, and if you’re looking for a good all-around tuner app for a phone or tablet, you will almost certainly find everything that you are looking for here. As you can see in the above screenshots, you’ve got a nice-sized tuner screen, easy access to a pitch pipe, and on-screen access to change several common options. The tuning accuracy seems excellent with no sensitivity or damping options (or real need for them). Using a computer-generated tone, Tunable consistently measured within 1 or 2 hundredths of a cent – exceptionally accurate! 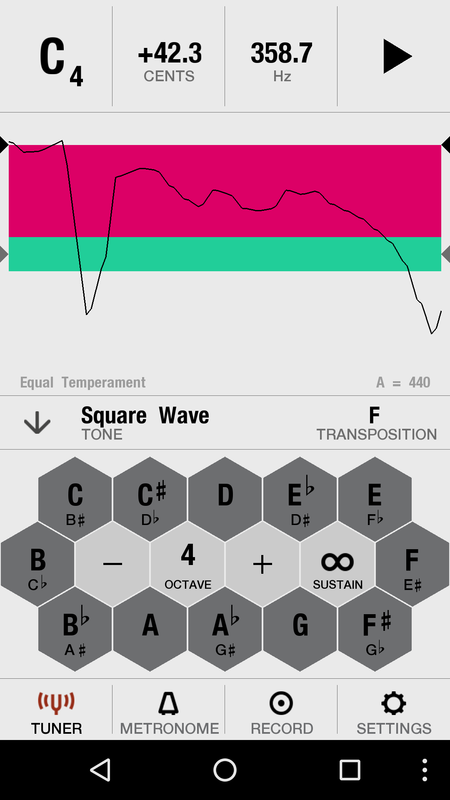 A nice feature of the app includes the readout of your deviation (in cents) from where the note is ‘in tune’, and a readout of the actual frequency that you are playing. One small downside – when in a tuning other than Equal temperament, there’s no indication of the difference between where the Equal temperament note would be ‘in tune’ and where the altered temperament is ‘in tune’. Some of the options available in the tuner include the temperament (many options included, but no custom option) and its root, the transposition (any possible key), the ability to alter the A from something other than 440, and an option to ignore vibrato (this is, I imagine, actually changing the needle’s sensitivity). The pitch pipe function is also easily available from the tuner screen (a great design decision!). There are about 7.5 octaves available, which cover just about any pitch you’ll need. The four different wave options are easily selected from this screen, and provide four different choices of timbre. One very nice touch on the pitch pipe – when you select a different temperament and key center, the pitch pipe will automatically adjust the pitch pipe to sound the ‘altered’ pitches. It’s also polyphonic, so you can play some pretty crunchy chords if you play outside the key center in some of the more exotic temperaments! The nice thing about this app is that it includes more than just a tuner. 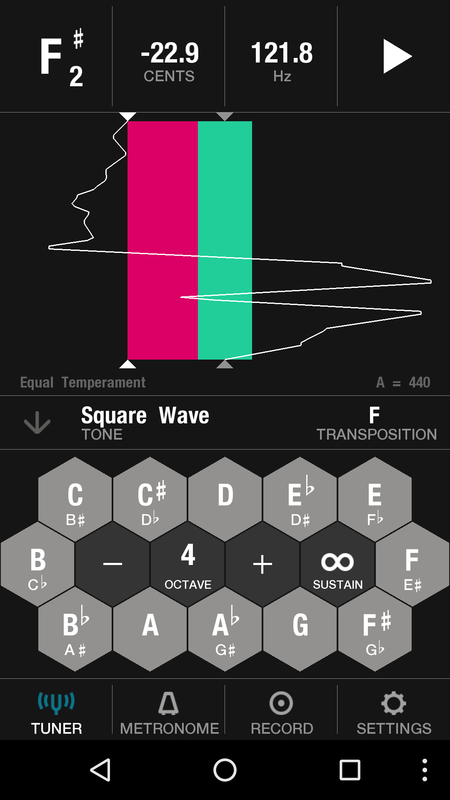 Although the included metronome isn’t extravagant or full of options, it does give you good, basic metronome functions in a single app. The tempo markings at the bottom allow you to get an idea of an ‘average’ tempo for many markings (adagio, andante, allegro, etc.) and it also changes the tempo marking in a larger steps than the +/-, which changes in 1 BPM increments. While you can press and hold on the + or – to change quickly, on many devices that will obscure the BPM number, so it’s easier to use the tempo marking bar. 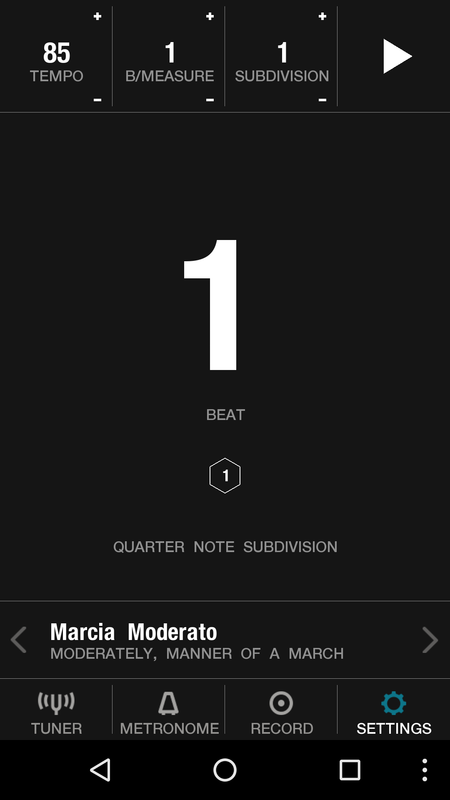 You can change the subdivision from 1 click per beat all the way up to 8 clicks per beat (32nd notes), and have up to 16 beats in a bar. There’s no separate options for a first beat accent, but you can simply select 1 beat in a bar and that will accomplish the same thing. Their is an option in the settings to turn on a ‘visual’ cue for the metronome, and this gives a red (for the downbeat) or green (all other beats) background, along with the beat number. One thing that is missing, however, is the ability to change sounds. The electronic beep is, for the most part, fine, but I do prefer a more wooden or mechanical click on my other metronome apps, and there’s no way to alter the default sound here. There is a volume adjustment in the app (separate from your phone’s media volume) but I also wish that there was either a shortcut to that volume slider from the app, or just a mute button, so you don’t have to go into the settings if you want to turn on the metronome silently). Recording yourself on a cell phone (or a tablet) is always a mix of useful and disheartening. The microphone on most smaller devices is not nearly well-calibrated enough to capture the dynamic range or frequency range of most instruments, so you have to take some of what you hear with a grain of salt. 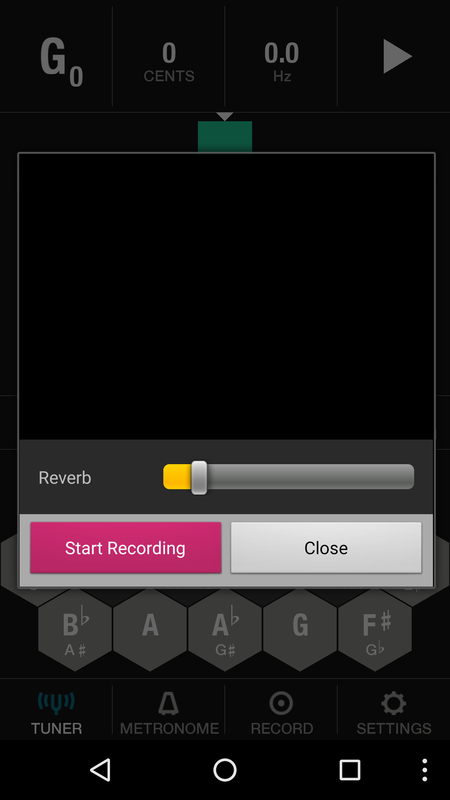 That being said, though, this app will allow you to make a quick-and-dirty recording of an etude, excerpt, or other musical idea. Overall, this is a more complete and well-rounded app than ClearTune, and it’s also a little bit cheaper. It’s not perfect, but if you’re in a bind and looking for one app that will be a pretty excellent tuner and have a metronome and basic recording functions, I don’t think you can go wrong with Tunable. It’s available for iOS, Android, and the Amazon app store for $2.99. You can find a longer list of apps for musicians here, and all my reviews of musical apps are right here.